You are cordially invited to attend a Facebook Live event this coming Thursday, April 11, 2019 at 10 a.m. ET. What would you like to know about the future of small business apps? Are you interested in the latest news from Zoho? Ask your questions on the Small Business Trends Facebook page at the event here. Anita Campbell and Brent Leary are hosting an AMA (ask me anything) with guest Sridhar Vembu. Vembu is the CEO of Zoho. And the AMA takes place during the live Zoholics event. Anita Campbell, CEO of Small Business Trends LLC, parent company for Small Business Trends and BizSugar. Brent Leary, CRM industry analyst, speaker, author, award-winning blogger and co-founder and partner in CRM Essentials. Brent is an advisory board member for BizSugar. How: Ask questions on Facebook on the Small Business Trends Facebook Live event page here. Zoholics is an annual developer’s conference in Austin, Texas where Zoho shares their plans for the future. It gives Zoho users and business owners considering Zoho One or any of the Zoho Apps a chance to meet developers one-on-one. Watch for activities related to Zoholics by using the hastag #Zoholics19. 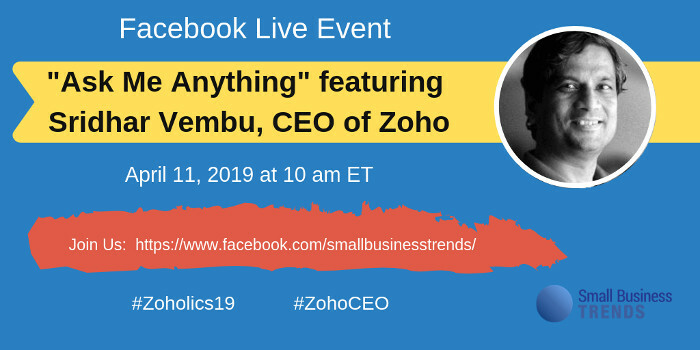 For questions and answers specific to the Facebook Live AMA with Sridhar Vembu, use #ZohoCEO. What would you like to know about Zoho? You can read more about Zoholics in our previous post about the Zoholics Ticket giveaway. Disclosure: Small Business Trends, LLC, the parent company of BizSugar, has a commercial relationship with Zoho. Zoho is a sponsor of BizSugar. Thanks a lot for sharing with us. I read more about Zoholics in your previous post. I hope that I can know about the future of small business apps from the answers during the AMA. I’ll apply it to my business. Do remember to log into Facebook and go the the Small Business Trends Facebook page and click on the AMA event here. The answers to our past BizSugar AMAs are all inside the Mastermind Community. It is free to join here.